I am being warned that the ticks this year are going to be worse than ever and I should be extra cautious about lyme disease. What precautions should I take with my pets? May is Lyme Disease Awareness Month and Pennsylvania is the #1 state in reported cases of Lyme disease for both humans and dogs. Lyme disease (borreliosis) is an infectious, tick-borne disease first recognized in dogs in 1985. 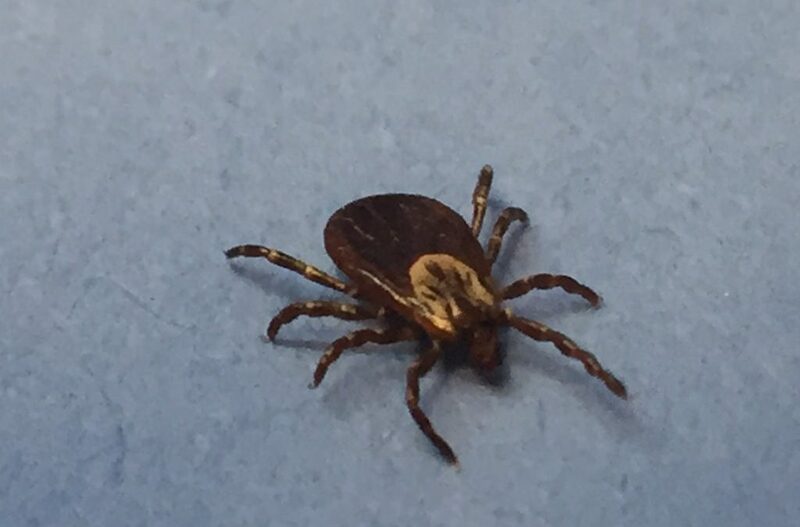 It is caused by Borrelia burgdorferi, a type of bacteria called a ‘spirochete.’ The common deer tick Ixodes scapularis (formerly called Ixodes dammini) is the primary carrier of B. burgdorferi in the Northeast and upper Midwest. The tick Ixodes pacificus is the primary carrier in the western United States. Generally, it takes about 48 hours of tick attachment for the transmission of the bacteria to occur. In humans we often associate early symptoms of Lyme disease to include muscle or joint pain, headache, fever, fatigue and swollen glands. Many humans will develop a circular area of redness around the bite (“bullseye”) whereas dogs do not. In dogs we generally report lethargy, decreased appetite, lameness, swollen joints and fever. In some dogs it can progress to a more severe condition called Lyme Nephritis, which greatly affects kidney function and can even lead to kidney failure. Lyme disease can be diagnosed by a blood test performed by your veterinarian. An initial test may be performed to screen for the presence of antibodies against the disease. A positive result indicates the dog was exposed to the bacterium, but may or may not be actively infected with Lyme disease. If your veterinarian is concerned about Lyme disease he or she may recommend a second blood test called a Quantitative Lyme C6 test that detects antibodies against a specific protein called “C6”, which is unique to the Borrelia bacteria. A numerical value based on the number of antibodies is given to help guide whether treatment should be recommended. The C6 antibodies are detected three to five weeks after a dog has been bitten by an infected tick. Your veterinarian may also suggested additional bloodwork and urine testing to evaluate kidney function. Treatment for Lyme disease is most frequently with a tetracycline based antibiotic called Doxycycline. In some cases amoxicillin is used. The duration of therapy is generally between 14-30 days. I generally treat for 30 days especially if an animal is showing any abnormal clinical signs. Prevention is extremely important in protecting your dog from any tick-borne diseases, including Lyme disease. There are several preventatives available including both topical and oral formulations. There are also certain flea and tick prevention collars on the market that act effectively to kill and repel external parasites for up for several months. For those dogs that live in a wooded or tick-prone area a pet owner may consider having the lyme vaccine administered to their dog. The lyme vaccine has not been proven to be as effective as other vaccines. The lyme vaccines appear to prevent illness in about 60-86% of cases, but does not provide the same immunity in all dogs and needs annual boosters. Many veterinarians recommend strict flea and tick prevention over the vaccine considering it is not 100% effective and has a great number of post vaccine reactions. While others strongly support the use of the vaccine, especially in breeds of dogs such as Golden Retrievers and Labrador Retrievers, which are speculated to be at a greater risk for lyme nephritis. Overall, consider following a strict preventative plan with your dog at home, check them for ticks following outdoor activities and discuss annual blood testing with your veterinarian.